CRESEMBA® (isavuconazonium sulfate) is indicated for the treatment of invasive aspergillosis and invasive mucormycosis in adults. Usage Specimens for fungal culture and other relevant laboratory studies (including histopathology) to isolate and identify causative organism(s) should be obtained prior to initiating antifungal therapy. Therapy may be instituted before the results of the cultures and other laboratory studies are known. However, once these results become available, antifungal therapy should be adjusted accordingly. *Liver laboratory elevations included alanine aminotransferase (ALT), aspartate aminotransferase (AST), alkaline phosphatase, bilirubin, and gamma-glutamyltransferase. Hepatic Adverse Drug Reactions (e.g., elevations in ALT, AST, alkaline phosphatase, total bilirubin) have been reported in clinical trials and were generally reversible and did not require discontinuation of CRESEMBA. Cases of severe hepatic adverse drug reactions including hepatitis, cholestasis or hepatic failure including death have been reported in patients with serious underlying medical conditions (e.g., hematologic malignancy) during treatment with azole antifungal agents, including CRESEMBA. Evaluate liver tests at the start and during therapy. Monitor patients who develop liver abnormalities during CRESEMBA therapy for severe hepatic injury. Discontinue if clinical signs and symptoms consistent with liver disease develop that may be attributable to CRESEMBA. Infusion-Related Reactions including hypotension, dyspnea, chills, dizziness, paresthesia, and hypoesthesia were reported during intravenous administration of CRESEMBA. Discontinue the infusion if these reactions occur. Serious Hypersensitivity and Severe Skin Reactions, such as anaphylaxis or Stevens Johnson syndrome, have been reported during treatment with other azole antifungal agents. Discontinue CRESEMBA if a patient develops a severe cutaneous adverse reaction. Caution should be used when prescribing CRESEMBA to patients with hypersensitivity to other azoles. Embryo-Fetal Toxicity: During pregnancy, CRESEMBA may cause fetal harm when administered, and CRESEMBA should only be used if the potential benefit to the patient outweighs the risk to the fetus. Women who become pregnant while receiving CRESEMBA are encouraged to contact their physician. Drug Interactions: Coadministration of CRESEMBA with strong CYP3A4 inhibitors such as ketoconazole or high-dose ritonavir and strong CYP3A4 inducers such as rifampin, carbamazepine, St. John's Wort, or long-acting barbiturates is contraindicated. Drug Particulates: Following dilution, CRESEMBA intravenous formulation may form precipitate from the insoluble isavuconazole. Administer CRESEMBA through an in-line filter. 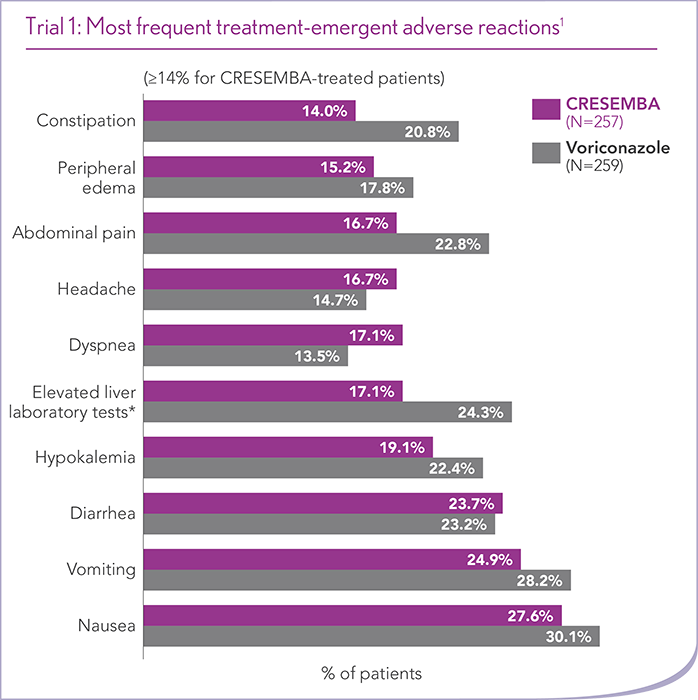 The most frequently reported adverse reactions among CRESEMBA-treated patients were nausea (26%), vomiting (25%), diarrhea (22%), headache (17%), elevated liver chemistry tests (16%), hypokalemia (14%), constipation (13%), dyspnea (12%), cough (12%), peripheral edema (11%), and back pain (10%). The adverse reactions which most often led to permanent discontinuation of CRESEMBA therapy during the clinical trials were: confusional state (0.7%), acute renal failure (0.7%), increased blood bilirubin (0.5%), convulsion (0.5%), dyspnea (0.5%), epilepsy (0.5%), respiratory failure (0.5%), and vomiting (0.5%). CRESEMBA is an azole antifungal indicated for patients 18 years of age and older for the treatment of invasive aspergillosis and invasive mucormycosis. Specimens for fungal culture and other relevant laboratory studies (including histopathology) to isolate and identify causative organism(s) should be obtained prior to initiating antifungal therapy. Therapy may be instituted before the results of the cultures and other laboratory studies are known. However, once these results become available, antifungal therapy should be adjusted accordingly. References: 1. CRESEMBA® (isavuconazonium sulfate) [package insert]. Northbrook, IL: Astellas Pharma US, Inc. 2. Maertens JA, Raad II, Marr KA, et al. Isavuconazole versus voriconazole for primary treatment of invasive mould disease caused by Aspergillus and other filamentous fungi (SECURE): a phase 3, randomised-controlled, non-inferiority trial. Lancet. 2016;387:760-769. 3. Marty FM, Ostrosky-Zeichner L, Cornely OA, et al; for the VITAL and FungiScope Mucormycosis Investigators. Isavuconazole treatment for mucormycosis: a single-arm open-label trial and case-control analysis. Lancet Infect Dis. 2016;16:828-837. 4. Data on file. Northbrook, IL: Astellas Pharma US, Inc. 5. Desai A, Kovanda L, Kowalski D, Lu Q, Townsend R, Bonate PL. Population pharmacokinetics of isavuconazole from phase 1 and phase 3 (SECURE) trials in adults and target attainment in patients with invasive infections due to Aspergillus and other filamentous fungi. Antimicrob Agents Chemother. 2016;60:5483-5491. 6. Groll AH, Desai A, Han D, et al. Pharmacokinetic assessment of drug-drug interactions of isavuconazole with the immunosuppressants cyclosporine, mycophenolic acid, prednisolone, sirolimus, and tacrolimus in healthy adults. Clin Pharmacol Drug Dev. 2017;6:76-85. doi:10.1002/cpdd.284. 7. Yamazaki T, Desai A, Goldwater R, et al. Pharmacokinetic interactions between isavuconazole and the drug transporter substrates atorvastatin, digoxin, metformin, and methotrexate in healthy subjects. Clin Pharmacol Drug Dev. 2017;6:66-75. doi:10.1002/cpdd.280. 8. Townsend R, Dietz A, Hale C, et al. Pharmacokinetic evaluation of CYP3A4-mediated drug-drug interactions of isavuconazole with rifampin, ketoconazole, midazolam, and ethinyl estradiol/norethindrone in healthy adults. Clin Pharmacol Drug Dev. 2017;6:44-53. doi:10.1002/cpdd.285. 9. Yamazaki T, Desai A, Goldwater R, et al. Pharmacokinetic effects of isavuconazole coadministration with the cytochrome P450 enzyme substrates bupropion, repaglinide, caffeine, dextromethorphan, and methadone in healthy subjects. Clin Pharmacol Drug Dev. 2017;6:54-65. doi:10.1002/cpdd.281. 10. Yamazaki T, Desai A, Han D, et al. Pharmacokinetic interaction between isavuconazole and a fixed-dose combination of lopinavir 400 mg/ritonavir 100 mg in healthy subjects. Clin Pharmacol Drug Dev. 2017;6:93-101. doi:10.1002/cpdd.282. CRESEMBA®, Astellas®, and the flying star logo are registered trademarks of Astellas Pharma Inc.
QUICK START+® is a registered trademark of Astellas US LLC. CRESEMBA Support Solutions is a component of Astellas Pharma Support SolutionsSM. Astellas Pharma Support Solutions is a service mark of Astellas Pharma US, Inc. The website you are linking to is neither owned nor controlled by Astellas Pharma US, Inc. Astellas is not responsible for the content or services on this site.